Having a cut finger is definitely not something that all of us would want to experience, as it is going to sting most of the time – especially when that particular cut happens to be very deep. Even worse is, we use our hands most of the time every single day, and a cut in the wrong place on your finger would be excruciatingly painful, and for those who have to use their hands to wash stuff with soapy water, it makes matters more complicated. 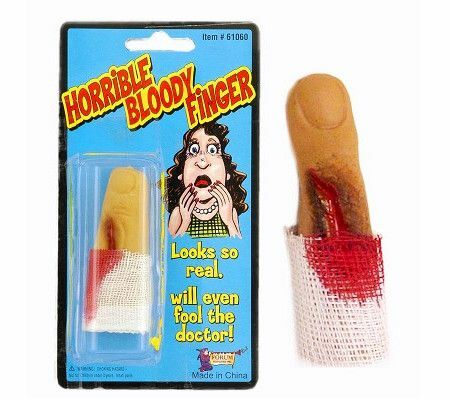 The $3.99 Horrible Bloody Finger Prank would let you scare the daylights out of those who are terrified of blood, and since it is so lifelike, you might actally use this to excuse yourself from performing the bunch of annoying tasks that you would very much prefer to avoid.